Five years ago, the community and Board of Education wanted access to more data, more communications, and greater transparency from LCUSD. Today, 85% of the community report satisfaction with communication from the district. Over 90% of parents of students in grades 7-12 would recommend LCUSD to other families. La Cañada Unified School District is a high-performing district north of Los Angeles, California. Each of its five schools has been designated a California Distinguished School. Yet, five years ago when Wendy Sinnette joined the district as superintendent, relations between the district and the community were in need of improvement. 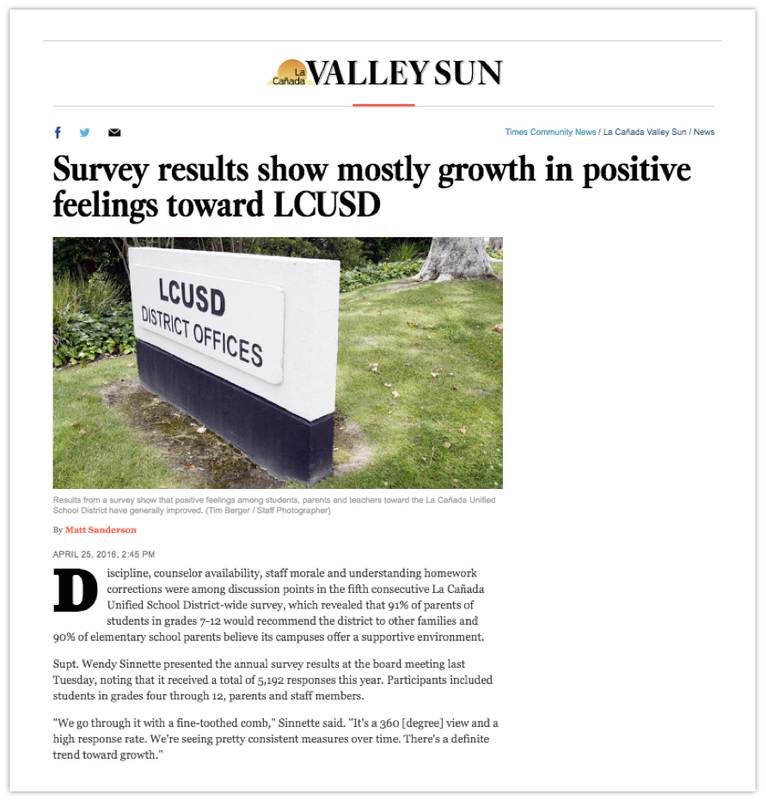 In order to foster better communication about the district's overall health and progress, LCUSD began using Panorama surveys to collect feedback from students, families, teachers, and staff. Superintendent Sinnette decided to provide survey results directly to teachers and administrators through Panorama’s online platform to support professional development and individual and schoolwide goal-setting. Five years later, 85% of the community report satisfaction with communication from the district. In Superintendent Sinnette’s latest report to the Board of Education, she shared that over 90% of parents of students in grades 7-12 would recommend LCUSD to other families, and 90% of parents of elementary students believe LCUSD’s campuses provide a supportive environment. Over the past four years, LCUSD has seen significant growth in students' perceptions of engagement in the classroom. The district uses Panorama surveys to collect and share student feedback directly with teachers for goal-setting and reflection. Five years after the initial strain in communication with the community, LCUSD has launched a strategic planning survey for California's Local Control and Accountability Plan (LCAP). “We saw north of 85% satisfaction from the community on communication,” says Superintendent Sinnette. LCUSD has focused improvements in district-wide communication and transparency. Superintendent Sinnette shares survey results with faculty, administrators, the Board of Education, and the community. At the beginning of the year, teachers at LCUSD sit down with principals to set goals using their student feedback results. LCUSD looks to teacher and staff feedback to surface areas for targeted professional learning opportunities, including paraprofessionals seeking additional training and growth. Student feedback is especially important to teachers in their first years of teaching at LCUSD, since the data is used in conversations and recommendations for tenure. Student and staff feedback has informed the agenda of the annual leadership retreat of principals with district administrators. 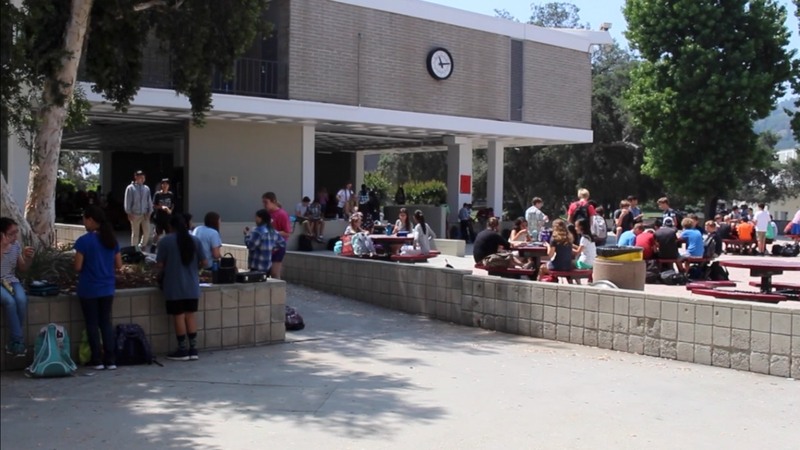 Based on student feedback on the upkeep of school buildings, administrators devoted budget to painting school buildings campus and adding custodians to certain school sites. After the district heard from families that they felt training for substitute teachers lagged behind the overall level of training and professionalism in the district, administrators created a more robust onboarding and training process.